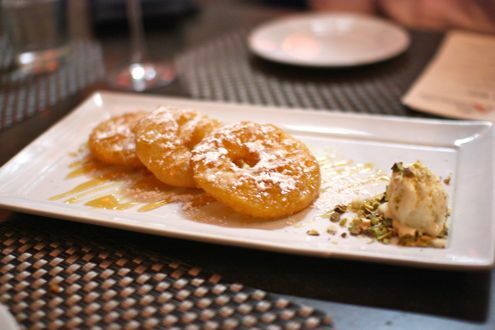 It’s been well documented how the restaurant scene on 14th Street has blown up over the last year or so. The Washington City Paper reported that no less than eight restaurants have opened up on the 14th Street corridor within the last month! Rachel and I learned first-hand how the demand for tables is sky-high no matter what day of the week it is. 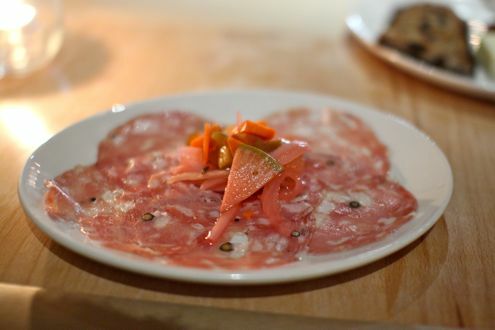 For example, we ventured down to Logan Circle on a Tuesday evening to check out Ghibellina, the new Italian gastropub by the owners of Eastern Market’s outstanding Acqua Al 2. We were quickly taken aback as we found out the wait for a table of two would be one hour. And this was on a Tuesday! I’m sure the same could be said for the bustling Le Diplomate, whose patios were filled to the brim with diners across the street eating al fresco in the warm, summer weather. Pearl Dive Oyster Palace was adjacent to Ghibellina, so we grabbed some barstools at their outdoor bar and had a few drinks while we waited for our table. Exactly sixty minutes later, the restaurant had called informing us our table was ready. Unlike Acqua Al 2, Ghibellina’s menu is focused around small plates, featuring everything from salads to meats & cheeses to pizzas and pastas. Rachel and I started out the evening with their Salame Toscano, which featured salami sourced from California’s Fra ‘Mani. Topped with picked vegetables, this was a nice way to kick off our Tuscan meal. Our next course was a cheese plate – Quadrello Di Bufala. 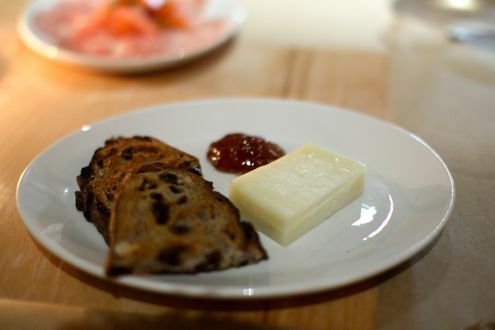 This creamy buffalo milk cheese was accompanied with raisin walnut bread and fig jam. All three items really complemented one another as we spread the soft cheese across the bread and lightly topped it with the fig jam. 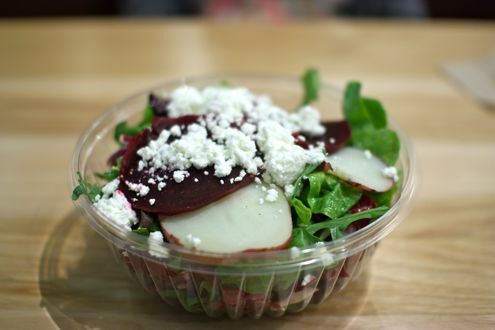 Next was the Insalata Ghibellina, the restaurant’s signature salad. 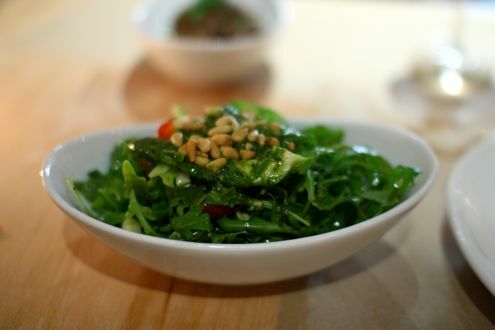 Featuring arugula, avocado, confit, tomatoes, Emmenthaler Swiss cheese, pine nuts, and pesto, this made for a light and refreshing dish given the summery weather. The ingredients really worked well together and we loved the subtle touch of pesto in the salad. We moved onto the main courses with the carne portion of the menu. If there’s one item to order it’s definitely the Stracotto. The dish features a very generous portion of succulent pot roast prepared with white wine and tomato. This was my favorite dish of the evening as the beef was incredibly tender and flavorful, plus this was a perfect amount to split between two people. 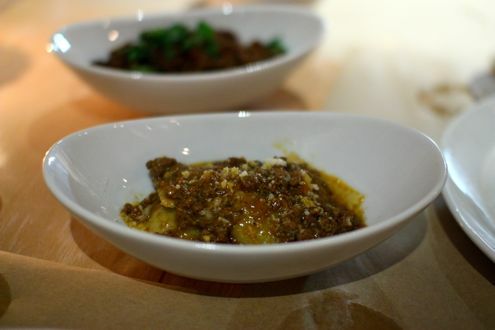 For the pasta course, we ordered the Tortelli Di Patate Al Ragu, which was basically potato-filled ravioli. 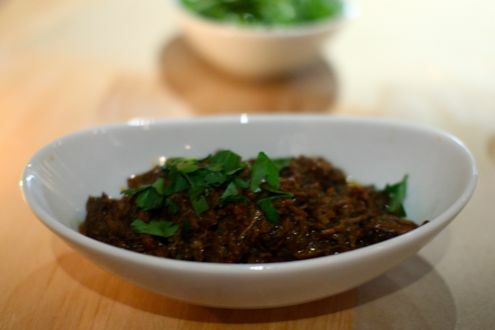 Topped with a wonderful beef ragu and sprinkled with Parmesan, we had no problem finishing it off. Granted it was a little heavy, especially since we already had the Stracotto, but it was a still a great pasta selection. 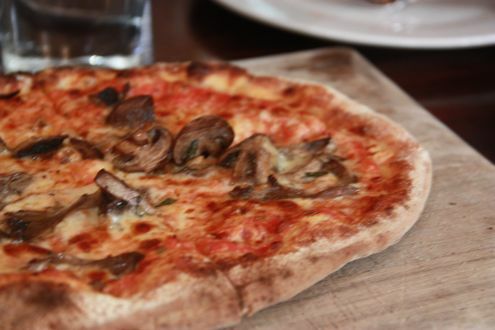 Our final dish of the evening was their Napoli pizza. Prepared with tomatoes, anchovies, olives, oregano, garlic, and mozzarella, this pizza had some bite. It might have been just a tad too spicy for Rachel, but we both remarked how chewy the crust was while being soft and gooey in the middle. And yes, the pizza was uncut, which is how it should be since Ghibellina serves Neapolitan-style pies. Overall, we had a lovely time at Ghibellina. We enjoyed everything we ordered, the plates came out in a timely fashion, and we never felt rushed despite how packed it was. 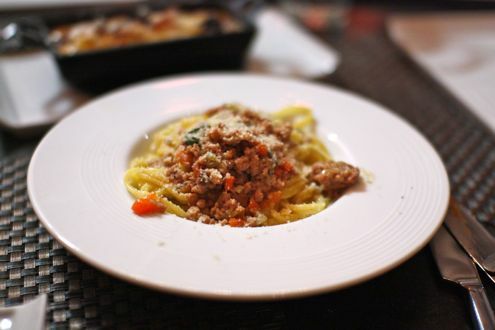 If you’re looking for a casual Italian eatery with plenty of options to choose from, we cannot recommend Ghibellina enough. 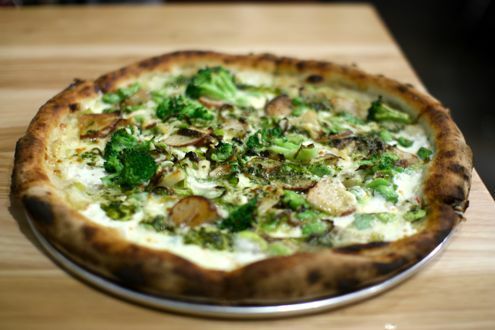 Be sure to tune in to WETA at 8pm tonight for a wonderful half-hour program on Washington’s ever-growing pizza scene. 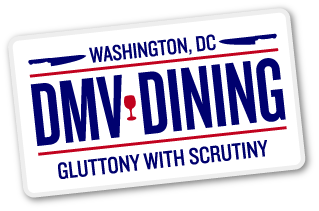 This program covers an array of pizzerias, old and new, in Maryland, Virginia, and the District. 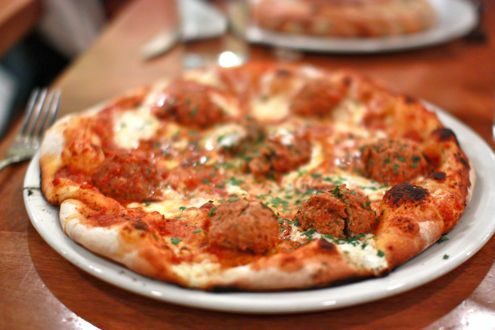 From Neapolitan to deep-dish Chicago to New Haven style, Pizza in Washington talks to the owners and chefs of some noteworthy establishments such as Pizzeria Orso, Matchbox, Menomale, and the original Ledo Restaurant, just to name a few. So sit back, grab a slice, and watch as WETA takes you around some of the area’s best pizzerias. 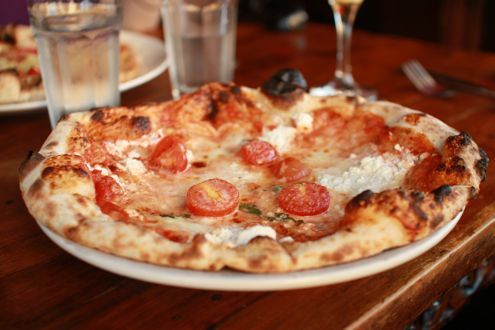 Pizza in Washington airs tonight on WETA at 8pm. Future showings as well as a channel guide can be found here. First of all, it’s great to be back. We have been on hiatus since welcoming our first child into the world, but we also have plenty of content to share with our readers that we obviously have not had time to get to. Until now. 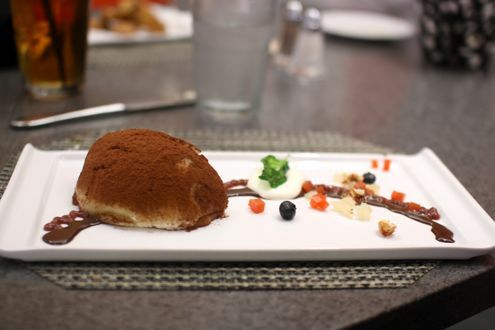 So let’s flash back to last month’s Restaurant Week. Rachel, I, and a couple of our friends were looking for a restaurant participating for lunch. We were in search of a place that we had not tried before, offered a good value compared to ordering a la carte, and that was kid-friendly for our friend’s 17 month old. Rachel and I had been meaning to check out La Forchetta (which has recently been renamed to Al Dente) since news broke out that Roberto Donna would be helming the kitchen. It’s amazing that our visit to the short-lived Galileo III was not even over a year ago, yet just ten months later, Chef Donna has already found a new residence. As for Al Dente’s lunch menu, it might have been one of the very best deals for Restaurant Week given the $20 price tag for three courses. 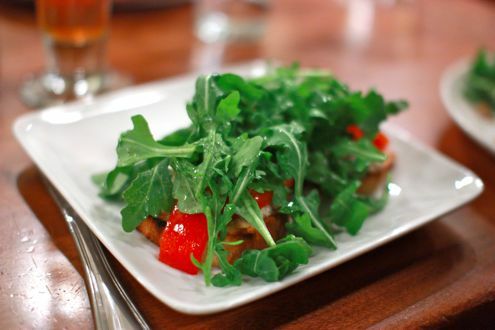 For the first course, diners had a choice between paninis, soup, salad, pizza, as well as appetizers of the day. Considering that some of the pizzas top out at $13.95, it’s an incredible value. 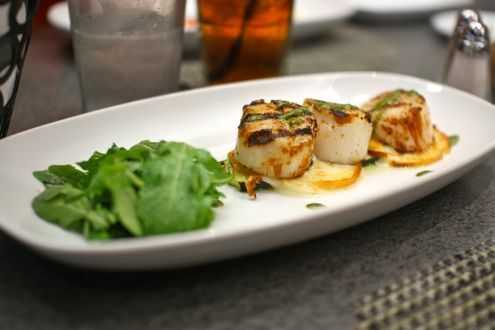 And if you think that’s impressive, Rachel’s grilled sea scallops, one of the special appetizers, was $16.95. Value aside, the trio of scallops was excellently cooked. As for my first course, I ordered the burrata with slow-roasted vine ripe tomato. 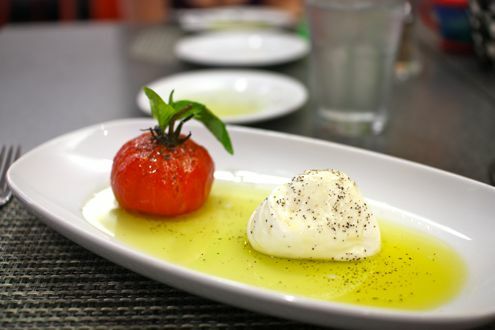 Soft, creamy, and swimming in a pool of olive oil, the burrata was a terrific starter. 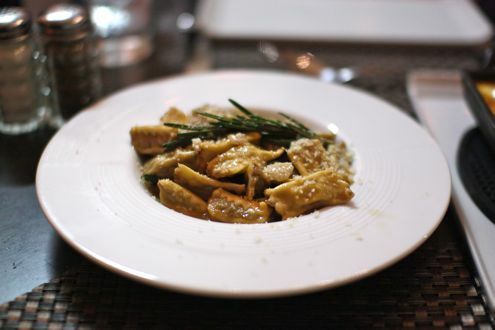 For our main course, diners had a choice between a selection of house made pastas, main dishes, and entrees of the day. 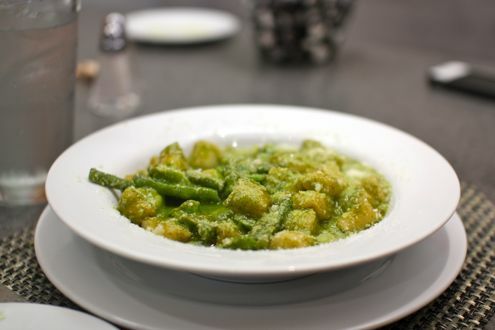 Rachel ordered the basil pesto gnocchi, which was blended with fava and string beans. 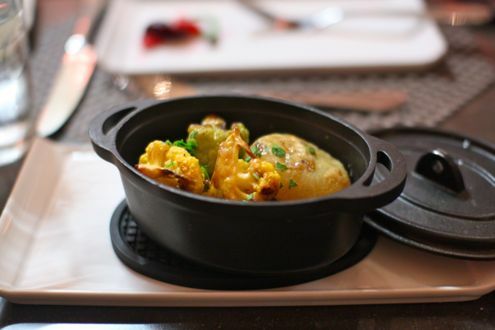 The potato dumplings were soft, delicate, and practically melted in your mouth. The pesto sauce was just as good as it was rich with flavor and really complemented the pasta. 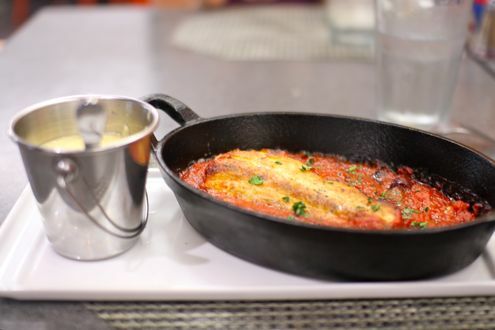 I went with one of the day’s specials – sautéed rockfish with pizzaiola sauce. I’m not one to typically order fish as my entrée, but Chef Donna hit this one out of the park. Not only was the fish perfectly cooked, but the pizzaiola sauce was simply fantastic. I seriously wanted a jar of this stuff to take home with me. 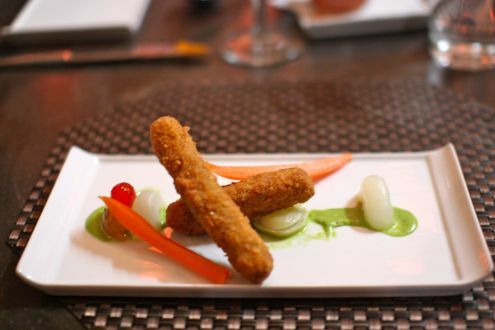 Oh, and on top of that, this dish would have cost $26.95 a la carte. Yeah, I couldn’t believe it either. For dessert, we had a choice between tiramisu and biscotti, so Rachel went with the former while I ordered the latter. 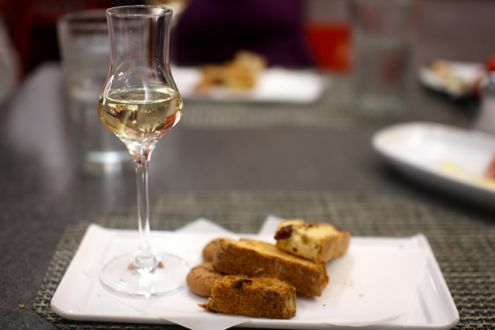 Even Al Dente’s dessert presentations were top notch as my biscotti was accompanied with a glass of moscato while Rachel’s tiramisu was artfully arranged. 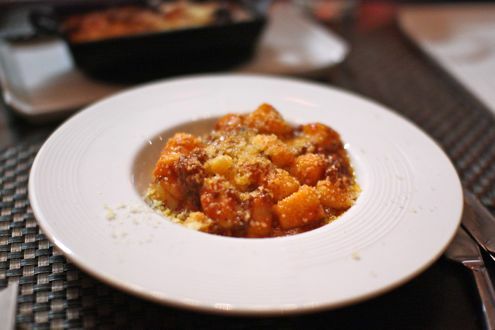 It’s not often that Rachel and I are blown away not only by the food but also the value of a Restaurant Week participant, but Al Dente wildly exceeded our expectations. 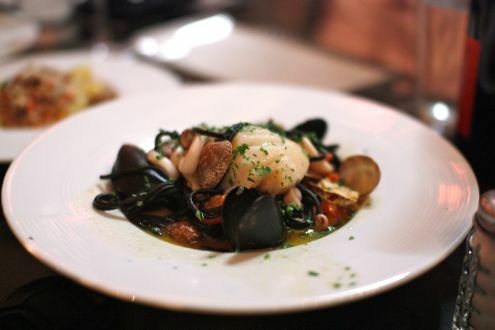 Not only do you get to take pleasure in Roberta Donna’s masterful cooking, but the prices, regardless if it’s Restaurant Week or not, are very reasonable. Oh, and ample parking is always a nice plus. Welcome back, Chef Donna. In what has nearly been a year in the making, Haven Pizzeria Napoletana finally opened in downtown Bethesda last week. 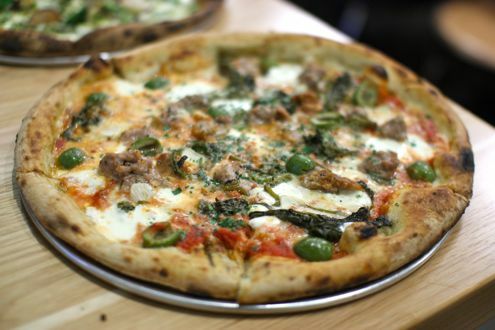 Influenced by New Haven pizzerias such as the famous Frank Pepe’s, Haven is the latest entrant in a town that has suddenly seen an influx of pizza joints. Haven, however, was a massive undertaking. With construction that had started last summer, the pizzeria features a large dining space lined with oak floors that were originally from the Maker’s Mark distillery. The two anthracite coal ovens can reach a temperature of up to 2200 degrees and collectively weigh 100 tons. Yeah, this isn’t your typical pizza parlor. 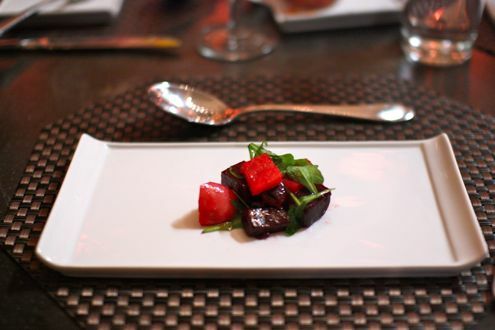 The menu keeps things simple: appetizers range from salads to meat and cheese boards (“peels”) to an enticing coal-oven tomato. 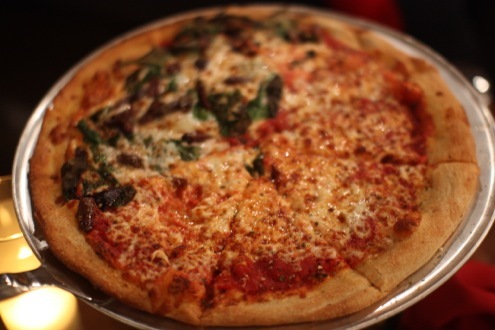 Pizza pies can be ordered in small or large sizes with additional toppings that will cost an extra $1.50 to $13 (fresh clams on a large pizza, in regards to the latter). Rachel and I decided to split a small tomato pie with mozzarella as well as a white clam pie. The charred crust is the most distinctive part of Haven’s pizza — thin and crispy with a hint of smokiness. 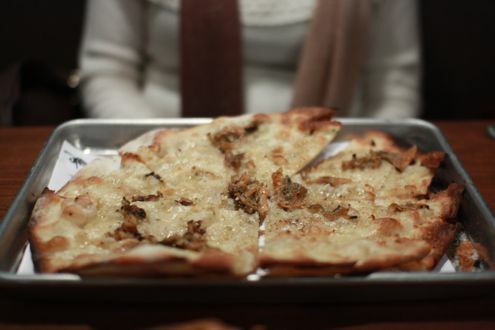 While the cheese pizza was nothing extraordinary, the white clam pie really stood out. The blend of olive oil, garlic, oregano, grated cheese, and fresh clams pays homage to New Haven in splendid fashion. 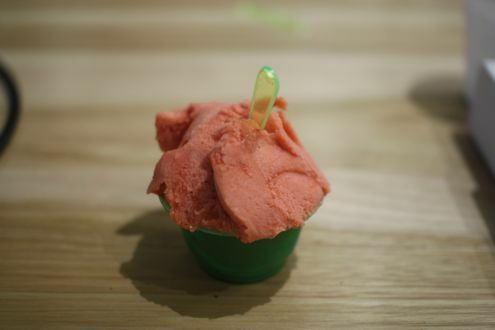 The housemade gelato, which is made every morning, is a must-get. 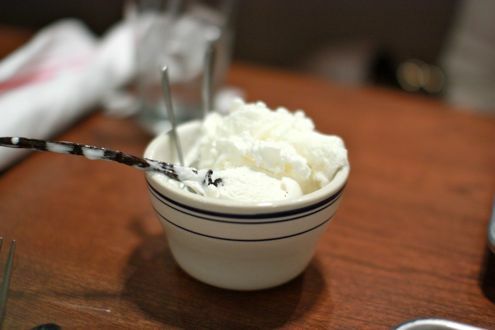 We opted for a bowl of the vanilla bean and loved every spoonful. You can even bring home a quart to-go, though $13 is sort of steep. One thing the restaurant needs to work on is their sound insulation – it was extremely noisy inside. Another qualm is their lackluster beer offerings. For a place that calls its bar area “Bar Haven”, there is not much of a selection to choose from. The most exotic brew they had was a bottle of Fat Tire. Meanwhile, Pete’s has an always-rotating draft list that features some terrific breweries. Of course, both of these issues can be remedied, and given that it was Haven’s first day, I’m sure that they are still working out the kinks. Haven Pizzeria Napoletana is located on 7137 Wisconsin Avenue in Bethesda. Rachel and I, as well as our friends Mike and Randi, scheduled a “dinner and a movie night” last weekend. We were planning to see The Artist at E Street Cinema later that evening, so Mike suggested we get dinner beforehand at Potenza. We haven’t been to Potenza in years, and given their reasonable prices and the proximity to the theater, it was an ideal choice. After receiving a basket of fresh bread along with a plate of oil and vinegar, we put our orders in with the waiter. Rachel decided to get the Mezzelune con Pollo Affumicato while I went with the Funghi pizza. When the pizza arrived, I happily surprised by the size of the pie. Cooked in their 6000 pound ceramic pizza oven, this was a generous portion, and for the price of $15, it’s enough to split between two people. As for the actual quality of the pizza, I thought it was rather good. Topped with Portobello, domestic and oyster mushrooms, tomato sauce, fontina, and parmesan, the two of us really enjoyed this pizza. With a charred, chewy crust and just the right amount of sauce, I nearly finished the entire pie. (And yes, while I could have, I would have been most likely passing out during the movie). 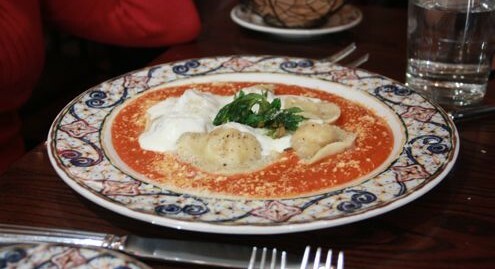 Rachel really enjoyed her mezzaluna dish of smoked chicken-filled ravioli, tomato parmesan sauce, house-made mozzarella, and crispy celery leaves. While there were only a few pieces on the dish, they were incredibly filling and she could barely finish what was there. The smoked chicken flavor was very pronounced yet delicious, and she didn’t think the sauce was too heavy. The mozzarella was beautifully drizzled on top and really went well with the chicken and sauce. Considering that I nearly forgot about Potenza amidst all of these new restaurants opening up around town, I’m glad we came back. We both really liked our entrees and felt that the price was right considering the portions as well as the quality. And while it was a little bit of a walk to the theater, it was probably for the best considering how much pizza I consumed that night. When one thinks of Local 16, their bar scene instantly comes to mind, specifically their rooftop terrace in the summertime. We haven’t been in years (mostly because it is typically too crowded), but an offer from The Capitol Deal a few months ago piqued our interest: $15 for a brunch entrée as well as bottomless mimosas or Bloody Mary’s. At first, we honestly had no idea that they served brunch, but after doing some digging, it turns out that Local 16 was also home to DC pizzaiolo Edan MacQuaid, formerly of local pizzerias 2 Amy’s and Pizzeria Orso. Evidently Local 16 was MacQuaid’s new residence and that his pizzas were receiving some rather high acclaim. While the brunch menu offered typical fare such as Eggs Benedict, pancakes, and French toast, both Rachel and I opted for one of their pizzas instead. 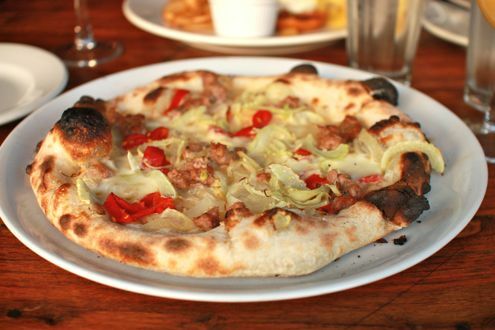 I ordered the Aden, which included house made sausage, piquillo peppers, caramelized onions, fennel, and mozzarella. The chewy crust had a nice char to it while the peppers added some spice to the dish. 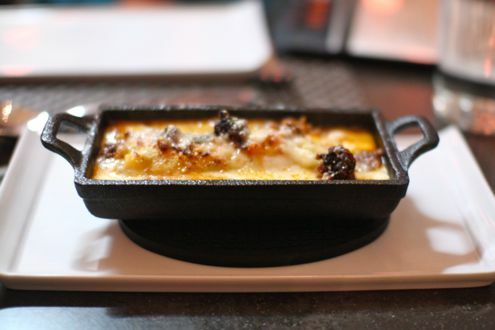 I particularly liked the sausage as it had a very pronounced flavor and blended well with the caramelized onions. Rachel went with the Garfield, which featured tomato sauce, cherry tomatoes, mozzarella, ricotta, and parmesan. Local 16 sources their produce from Whipple Farm in Virginia, so it’s no wonder that the cherry tomatoes were delightfully rich in flavor. And how we could not mention the bottomless pitchers of mimosas? Local 16 kept the libations flowing throughout our meal, even well after we finished our pizzas. Even better – they weren’t gradually diluting the beverages after each pitcher, something we’ve experienced at other restaurants offering unlimited drinks. For $15, it was an excellent deal. The pizzas alone will cost you $12 a la carte while glasses of mimosas and Bloody Mary’s are $3 and $5 each, respectively. The funny thing is that it had turned out we didn’t even need to buy The Capitol Deal voucher as Local 16 offers the brunch special year-round as long as you are a fan of their Facebook page. Good to know for next time, obviously. Just be sure to make a reservation as they do book up for this special. Coincidentally, Don Rockwell recently announced that MacQuaid will be partnering up with one of Local 16’s owners to open his very own pizzeria on 1832 14th Street NW. 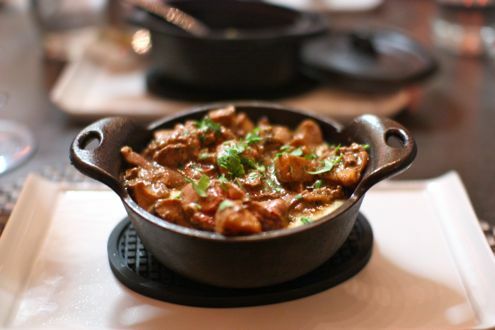 The menu will feature a handful of wood-fired oven pizzas as well as some other dishes. No projected opening date as of yet, but rest assured, we’ll gladly keep our eyes peeled on it. 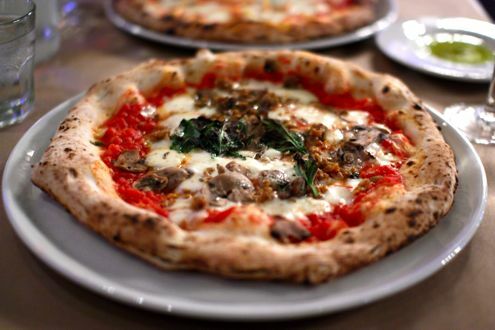 While there are several pizza parlors in Bethesda, there are only three we would definitely recommend: Vace, Pizzeria Da Marco, and Mia’s Pizzas. 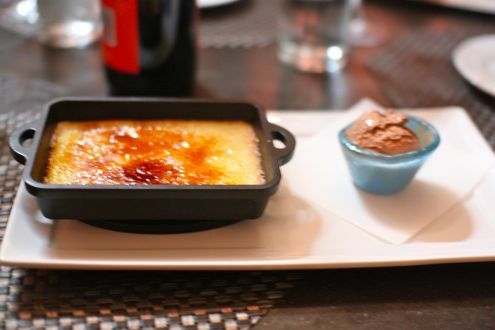 We have been to Mia’s several times and it has been solidly consistent on each and every visit. Located on Cordell Avenue next to the brahness of Caddie’s, Mia’s features a simple interior with an open kitchen in the back, complete with wood-burning oven. 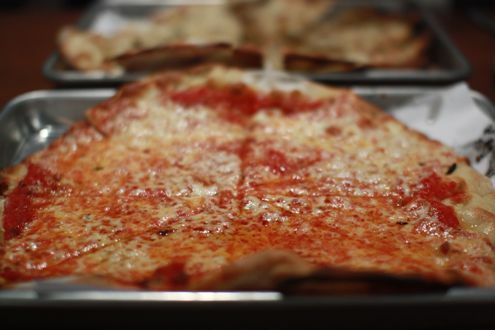 The menu features a dozen or so small plates, bruschetta, salads, pasta, calzones, and of course, pizza. 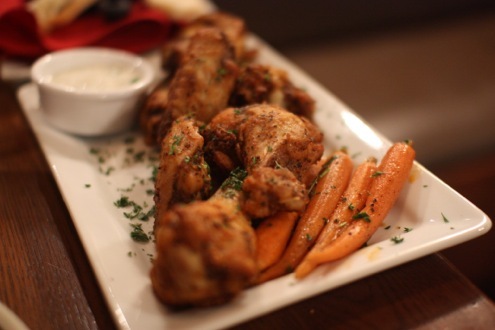 They also have nightly specials that range from roast pork loin to Italian-style pot roast. I went with a known commodity, their Meatball Pie. 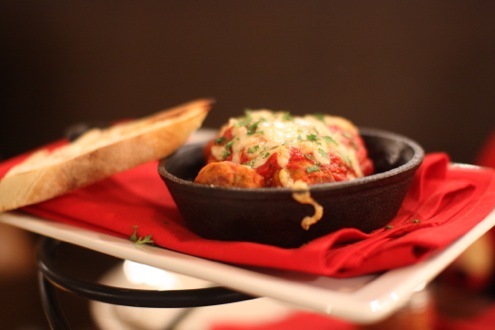 Featuring homemade meatballs, meat tomato sauce, parmesan, and mozzarella, it’s one of my favorites. 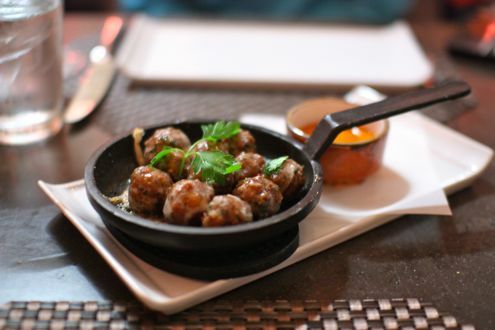 That’s attributed mostly to the house-prepared meatballs – they’re full of flavor, nicely seasoned, and most importantly, not dried out during the cooking process. Since we had eaten all day at home for our “indoor tailgate” during Octobergedden, Rachel wasn’t too hungry and decided to order two kinds of bruschetta and a salad. 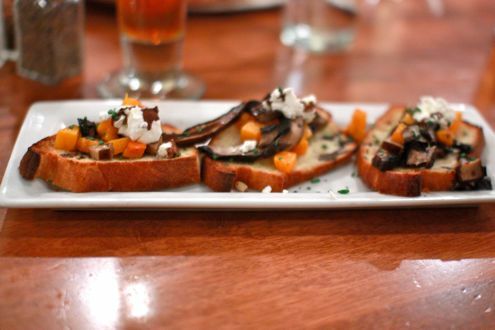 One came with an eggplant spread and roasted red peppers, and the other was prepared with butternut squash bits, goat cheese, and balsamic. Her salad consisted of arugula, pear, and gorgonzola. Needless to say, she should have gone with pizza. It’s not to say they weren’t good dishes, but they fell flat in her mind. 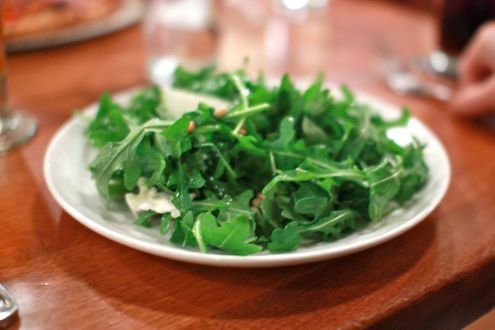 The cheese with the salad didn’t pair will with the arugula as it stuck together. The bruschetta with squash was actually small squash bits with cheese crumbles and fell apart as she tried to pick up the pieces. She liked the eggplant one better, but it was a little salty in her opinion. Like we said, your best bet is to stick with the pizza. She did eye some of the other small plates, and I’m sure the mac and cheese or deviled eggs would have been tasty too. 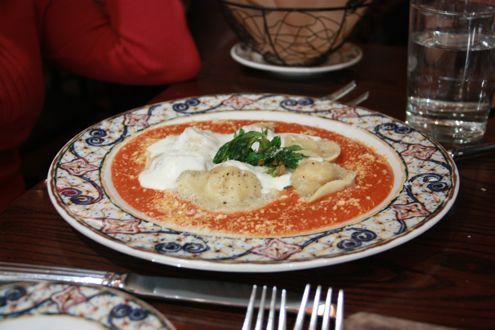 Mia’s is even more worth it if you’re with a party of four or more. 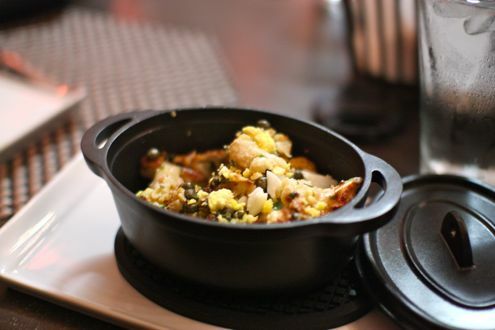 That way, you can share and sample a variety of their small plates as well as their pies. 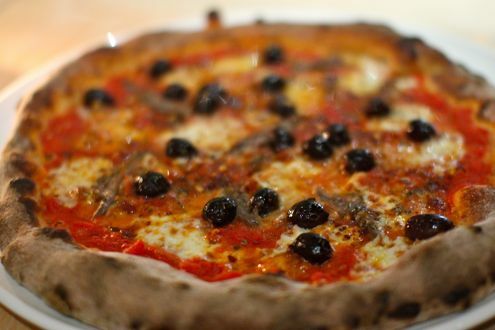 Nonetheless, if you’re looking for a casual night out in an unpretentious setting, Mia’s Pizzas is definitely the way to go.